If you were to fly over Newark as we moved from one century to the next, whether in a pack of angels or by helicopter, you would have seen a city that has changed greatly in recent years. Through the clouds a fresh landscape is taking shape—a fresh start in a new era. One thing that has started to change about Newark is its image. In general, no longer do national magazines poke fun at it in their cartoons, New York radio stations seldom trash Newark on the air, and even national talk-show hosts have curbed throwing out the name for a chuckle. This is not to say that the era of bad publicity is over, but reasonable people, both residents and outsiders generally are finding something positive to say about the city. Just as the nation's first president came to town in the depths of the Revolutionary War for supper with South Broad Street friends, our current president visited Newark at the close of last year to kick off a major national program to encourage public-private partnerships at Malcolm X Shabazz High School. Key new office centers along the new Newark skyline include the New Jersey Transit Building and the New Jersey Blue Cross and Blue Shield offices in the Ironbound and 744 Broad St. Another proposal would turn the Raymond Commerce into a four-college dormitory complex. Additionally, the Whitkoff Group has purchased the Gateway I; the Read Properties of Manhattan recently bought 24 Commerce Street; the Kushner Companies of Florham Park acquired the 440,000 square foot Mutual Benefit Life Building, which in turn was purchased by the IDT Corp., and the Bellemeade Development Corp. built One Newark Center. The four buildings in the Gateway complex comprise one of the state's largest office complexes. Across the street is Riverfront Plaza, and up the street is One Newark Center, home to the Seton Hall Law School, the Newark Club and prestigious office space. Near Military Park, Public Service Electric and Gas occupies the eastern end of the commercial area. 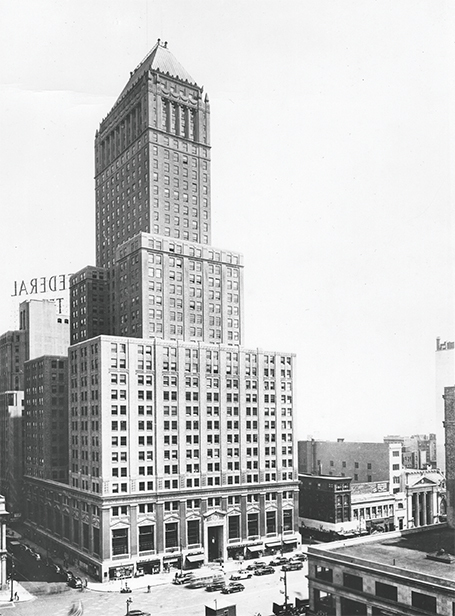 At Washington Park, the recently sold Mutual Benefit Life Building is just a few steps from the former First National State Bank later First Union building which is being remodeled. Plans call for the Rutgers building across the park to be converted into a luxury hotel. The structures, both new and old, form the commercial ribcage of a revitalized business centered Newark. The New Newark Foundation was established in 1997 expressly to enliven the city's core and to connect its diverse elements centered around the New Jersey Performing Arts Center. The foundation wants to restore Newark's luster as the state's most important city by bringing back its once thriving night life and attracting new residents to an area where its famous department store, movie houses and restaurants used to bustle with activity. New Newark proposes to draw the college crowd from the five college campuses, the workers of the downtown office buildings and residents from the city's distinct neighborhoods into a new geographical center. Another function is to provide first-rate, upscale housing for the city—a Palmer Square/Princeton type of village which will provide a permanent audience for a revitalizing city. This is all being planned by the foundation, which professes 'no legal standing, no government funding, and most of all by people who may not even live within miles of Newark.' A great city needs substantial movers and shakers, powerful advocates who can make long lasting and hard thought decisions, it needs corporate giants who can throw economic thunder bolts at the right times and to the right places, it need philanthropists and big league players, too. A well-tempered city must create from within, and not expect to have ascendancy passed along to it by Trenton or Washington. It needs, most of all, a team of individuals working together for a better day. This is what President Clinton advocated in his November 1999 Newark speech when he asked Newarkers to pursue a private-public partnership goal. The renewal strategy is simple—redevelop a four-block square area near the New Jersey Performing Arts Center jumping over Military Park to include the Griffith Building, Hahne's department store and Wiss jewelers and extend the area west to Rutgers' front door. The Amelior Foundation, with the support of Raymond Chambers, is directly engaged in the effort, and the success of Cleveland and Washington has been held up as successful examples of what could be done with proper dedication, planning and direction. Former Gov. Thomas Kean again has lent his support, as he did in the building of the NJPAC. Major corporations that have backed the plan and are working together to achieve it include Prudential Insurance Company of America, Lucent Technology, Bell Atlantic-New Jersey, Bristol-Myers Squibb, CIT, and PSE&G and Essex County Executive James Treffinger. Sports teams are an important element of the plan, including construction of one or two arenas equal to any standing in the United States today. Already, the New Newark Foundation has purchased 24 parcels of prime real estate for $16 million to complete the first phase in a possible downtown building and residential revival. All of this is occurring in an area surrounded by great landmark agencies—strong, vibrant and ready to lend a hand in the revival. They included the NJPAC, the Newark Public Library, the Newark Museum, the universities and the recently renovated business towers that are bringing commercial life back to New Newark. The central theme is a new upscale community to be named Halsey Village, a new central city residential, restaurant and commercial axis from which a new vitality will flow. Just as in the 'good old days' when Newark was the focal point for people all around, and when you were brought downtown by your mother or grandmother to shop at the great stores, lunch at one of many first-class restaurants or attend a matinee in one of the movie palaces, activity will again fill all those long empty spaces and demonstrate that Newark is not only the state's biggest but also its best city. The Special Improvement District is designed in Newark, as in other cities, to provide a special quality of life to the downtown district in the form of supplemental services 'such as maintenance, public safety, hospitality, promotional and physical programs that will enhance the setting for New Jersey's premier city.' It does, in other words, go beyond the normal services expected of regular city agencies, in effect, acting like a caring and genial host insuring that a good impression is left on residents, workers, students and visitors to Newark. Newark's SID, based upon a statutory designation for similar districts through the state, is designed to improve the economic strength of the central business district. It is governed by a 16-member Board of Trustees which meets monthly to conduct business, and is composed of business and property owners in the district along with municipal officials and staff. The organization is financed by a special assessment on commercial properties and billed through Newark's tax collector. Funds are then conveyed to it quarterly. Residential property is exempt. A committee system carries out the organization's function. Included is a Clean and Safe Committee. Special attention is paid to keeping the streets and sidewalks clean with brooms, mechanical equipment, and high-pressure hoses, and graffiti is especially singled out for removal. You have probably already seen the bright yellow street sweepers moving about their job since August 1999. The Safe Program employees are 'Safety Ambassadors' for safety and welcoming visitors. They are dressed in 'highly visible uniforms' and carry two-way radios. They also work closely with city police and act as 'eyes and ears' for public safety. The Physical Improvement Committee is charged with the responsibility of improving the 'downtown streetscape.' Areas of special concern include lighting, landscaping and facade improvement. This committee also strives to emphasize the importance of attention to city codes. A Landscaping Task Force was created in the spring of 1999. The Market Committee will 'introduce people to an invigorated Newark.' This is to be done through pointing out the city's diverse cultural background and international character. The Retail Committee meets monthly with merchants to coordinate promotions and events of interest and to 'disseminate information about the district.' Other activities of the SID include the Flower Pot Beautification Program, the Gift and Purchase promotion campaign, the establishment of a Web site, the Sweet City Concert Series, cooperation with the Festival of People, and a winter Holiday Season Program. While still in its infancy, this program holds out great promise for changing the face of the downtown section of Newark. Notice the flowerpots along Broad Street, see the bright yellow street and sidewalk cleaners, and watch the Christmas trees installed in the planter? This is only the beginning of a new and improved and central city. Next week we will look at some of the accomplishments of Newark in the recent past and immediate prospects in the future as part of our brief flight over Newark. So, fasten your safety belts. We're off on an interesting trip.